WAP stands for Wireless Application Protocol. It is a protocol designed for micro-browsers and it enables the access of internet in the mobile devices. It uses the mark-up language WML (Wireless Markup Language and not HTML), WML is defined as XML 1.0 application. It enables creating web applications for mobile devices. In 1998, WAP Forum was founded by Ericson, Motorola, Nokia and Unwired Planet whose aim was to standardize the various wireless technologies via protocols. WAP protocol was resulted by the joint efforts of the various members of WAP Forum. In 2002, WAP forum was merged with various other forums of the industry resulting in the formation of Open Mobile Alliance (OMA). The user opens the mini-browser in a mobile device. He selects a website that he wants to view. The mobile device sends the URL encoded request via network to a WAP gateway using WAP protocol. 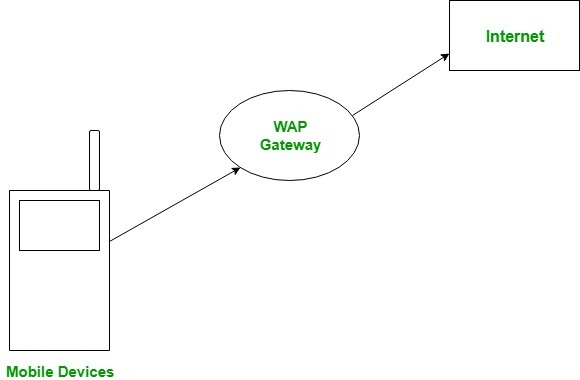 The WAP gateway translates this WAP request into a conventional HTTP URL request and sends it over the internet. The request reaches to a specified Web server and it processes the request just as it would have processed any other request and sends the response back to the mobile device through WAP gateway in WML file which can be seen in the micro-browser. This layer contains the Wireless Application Environment (WAE). It contains mobile device specifications and content development programming languages like WML. This layer contains Wireless Session Protocol (WSP). It provides fast connection suspension and reconnection. This layer contains Wireless Transaction Protocol (WTP). It runs on top of UDP (User Datagram Protocol) and is a part of TCP/IP and offers transaction support. 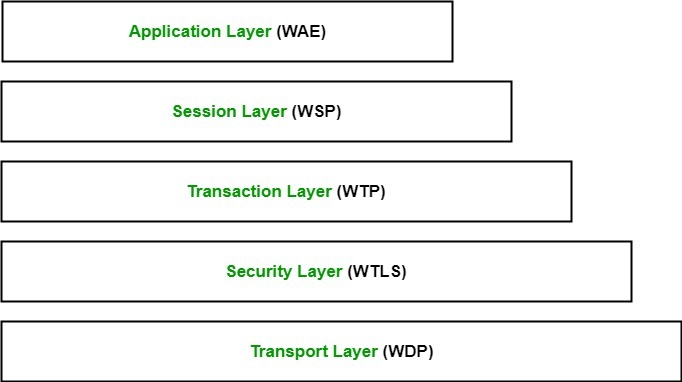 This layer contains Wireless Transaction Layer Security (WTLS). 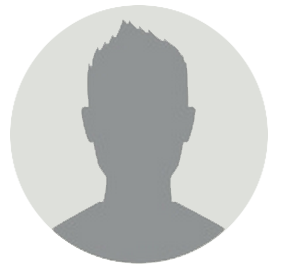 It offers data integrity, privacy and authentication. This layer contains Wireless Datagram Protocol. It presents consistent data format to higher layers of WAP protocol stack.